The United States Congress designated the Rodman Mountains Wilderness (map) in 1994 and it now has a total of 34,264 acres. All of this wilderness is located in California and is managed by the Bureau of Land Management. Colorful escarpments, white mountains splotched with red and black, a maze of canyons, and majestic bajadas come together in Rodman Mountains Wilderness. From northwest to southeast across the middle of the area, a large lava flow forms a long mesa that slices the terrain in two. More than a half-dozen natural tanks lie within the lava. Two of the tanks, named Hidden and Deep, contain thousands of gallons of water. Canyons with nearly vertical walls form deep drainage channels that cascade with water during desert storms. Faults created the valleys and ridges that play over the eastern and western portions of the area. Seven-mile Box Canyon is a non-Wilderness swath through the eastern portion, separating a small, far-eastern section from the rest of the Wilderness. 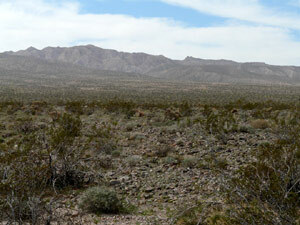 The Rodman Mountains are one of only seven core breeding areas for raptors in the California Desert, and golden eagles and prairie falcons thrive here. Bighorn sheep have not been spotted in these mountains, but they have been seen in Newberry Mountains Wilderness to the west. Planning to Visit the Rodman Mountains Wilderness? How to follow the seven standard Leave No Trace principles differs in different parts of the country (desert vs. Rocky Mountains). Click on any of the principles listed below to learn more about how they apply in the Rodman Mountains Wilderness.